Weslo treadmills are manufactured by the exercise equipment giant ICON Fitness as the company’s budget line. There will always be a market for bargain basement treadmills, and Weslo is targeted to this group. These are strictly stripped-down, make-do products that you should only consider if you really can’t afford to cough up the ching for something more substantial. It’s funny how well ICON understands the American mind. They’ve made a series of treadmills that skimp on the basics in terms of power and durability, but included some Weslo models that have interesting extras like iFit compatibility and in one case a small television screen. Uneducated consumers may get sucked in by the lure of getting such swell gizmos at what seems like a great price and forget to check Weslo treadmills out for performance and stability. The target audience for Weslo treadmills is the consumer who wants to start exercising but just can’t bring himself or herself to pay $1,000 or more for a treadmill that may end up being a very expensive coat rack. That’s fine if you know you’re going to be doing the minimum – walking periodically with some occasional jogging – but anything else and you’ll be sorely disappointed with your Weslo. The Weslo brand of treadmills meets the minimal standards for safety and durability. The skimpy 90-day warranty on all models demonstrates the low value ICON places on satisfying the customer with this budget line-up. Unfortunately, most people who buy a low-end Weslo treadmill ($100-$300) aren’t all that satisfied, saying they are insubstantial and loud. 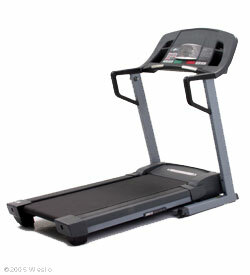 Particularly worrisome is the wobble if you weigh much over 150 pounds, which would be most people using the treadmill. Compare popular Weslo treadmills now on sale at Amazon! Cost-cutting measures on Weslo models include using peak duty motors instead of continuous duty motors. The peak duty motors are considerably less expensive, a saving that’s passed on to consumers, but on Weslos they burn out more quickly and tend to overheat easily when you try to push the treadmills to a run. The motors are also a bit small for treadmill running in general. Some of the running decks are as narrow as 13-15 inches, which just isn’t conducive to a comfortable stride. The saving grace of Weslo is that once you hit the $500 price point, you actually do get to what we would consider a reasonable budget offering. Decent width, acceptable motor and a higher weight limit. It’s not much in the way of extras, but the money has been diverted to making this an actual treadmill that you can push to running mode. If you absolutely can’t go over $500, Weslo treadmills are the only ones we’d consider, but don’t go any lower on price. Accoring to our latest Weslo treadmill review, the current model lineup includes the popular Weslo Cadence G 5.9 (which also comes in an "i" version), as well as the Cadence R 5.2, Cadence G 7.0, Cardiostride 4.0 and the Crosswalk 5.2T, all of which are priced at around $399 except the Cadence 7.0, which is showing $1999, which may or may not be accurate. The 5.2T has a 2.25HP motor, 16" x 47" belt, 0-10 mph speed, 2 position manual incline, 4 workouts, pulse heart rate, a 250 lb. max weight capacity and the unique Upper Body CrossWalk workout arms not found on any other models. The second most popular model, behind the Cadence G 5.9, gives you a slightly larger 2.5 HP motor and sider 16" x 50" deck, plus two more workouts for a total of 6 altogether. The top selling Weslo treadmill gives you a slightly higher max weight capacity, 275 lbs. and a stronger warranty than both the CrossWalk and the R 5.2. The G 5.9i gives you an integrated tablet holder. This is their top end model, but we can't tell if it is still available for sale. Te 7.0 gives you a blue tint display, up to 10% power incline and 8 workouts. Not a big improvement from any of the other models, so not sure why it's priced so much higher. Again, as we mentioned, the Weslo treadmills are all entry level, and we would only recommend them for basic walking and rehab. The Weslo Cadence G 5.9 and R 5.2 are the most popular models, so if you are set on a Weslo, look at those two first. And regardless of which model you choice, make sure you opt for the extended coverage, as the included warranty on all of the treadmills is quite flimsy. It's always good to have extra coverage in case something happens down the road. Still, our advice to you is to try to increase your budget just a little, perhaps to the $500+ range, and see what else is out there. 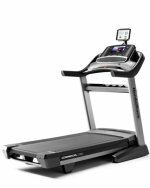 There are plenty of treadmills from ProForm, Horizon and NordicTrack that offer much more value. Weslo Cadence G 5.9 - A more attractive model than other Weslo machines, but with the flimsy design and weak motor there’s no point in taking a chance on this one. Weslo Cadence R 5.2 - A slightly upgraded G 5.9 with a more powerful motor, cushioning and two levels of incline capability.